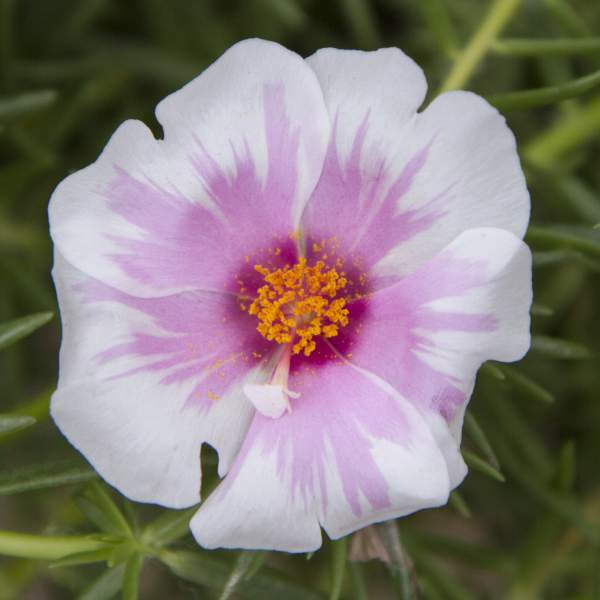 Purslane (in the genus Portulaca) are spreading succulents that may have originated in Europe or North Africa. Both our own purslane and our patented portulaca perform well in heat and drought and naturally load up with small, colorful blooms. Use purslane in hanging baskets or as colorful cascading elements in combination planters. For best results with Purslane, we recommend using a constant feed program of 200 ppm N. Maintain a pH between 6.0 - 6.5. Maintaining high light intensity and pinching are the best way to control height. An initial pinch is recommended, but additional pinching may be necessary to shape your final product. Aphids and thrips are the biggest pest problems with Purslane. Samba Pink Bicolor are not prone to many diseases, but watch for botrytis while the days are short. This grey rot is usually associated with wet or humid conditions. You can prevent botrytis by allowing the plant to dry out between waterings, allowing for good airflow in your greenhouse, and spacing to allow the sun to penetrate to the soil level. The most common chemicals used to treat botrytis are Medallion and Banrot. Use them as a drench according to each label’s instructions.